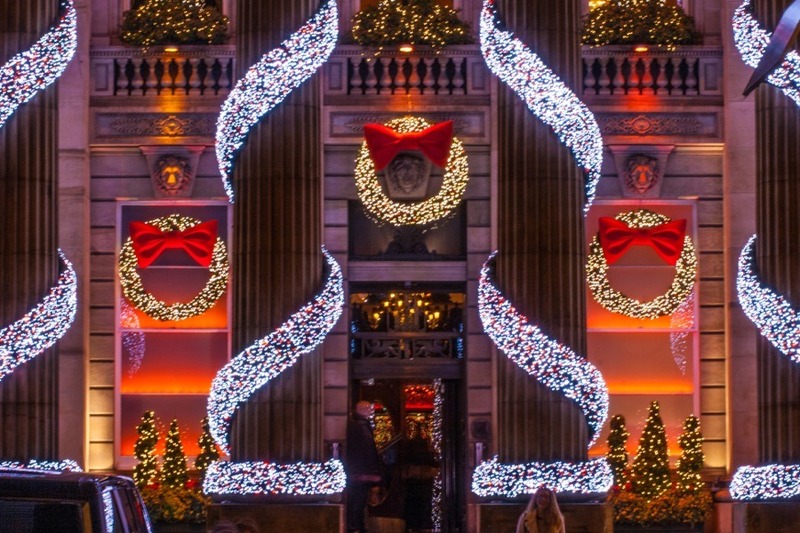 The run-up to Christmas is a great time to be in Edinburgh, with lots going on throughout the city. 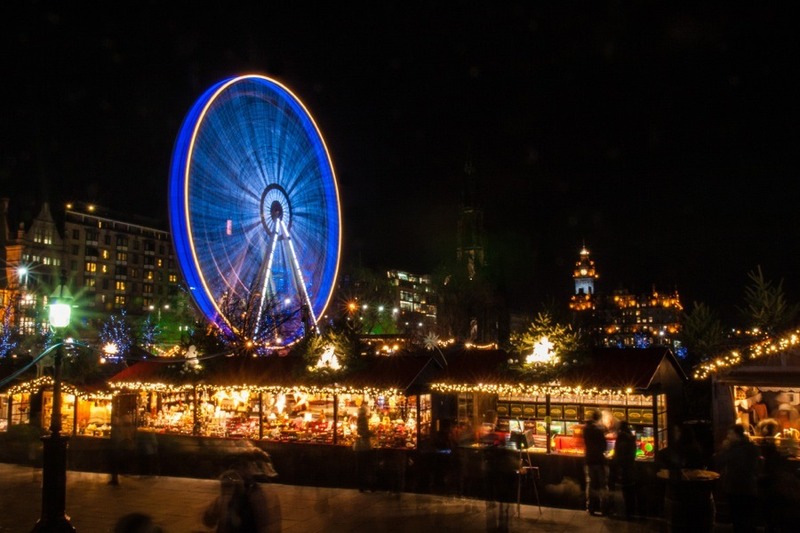 The main focus though is Edinburgh’s Christmas Market, a mixture of entertainment and market stalls. 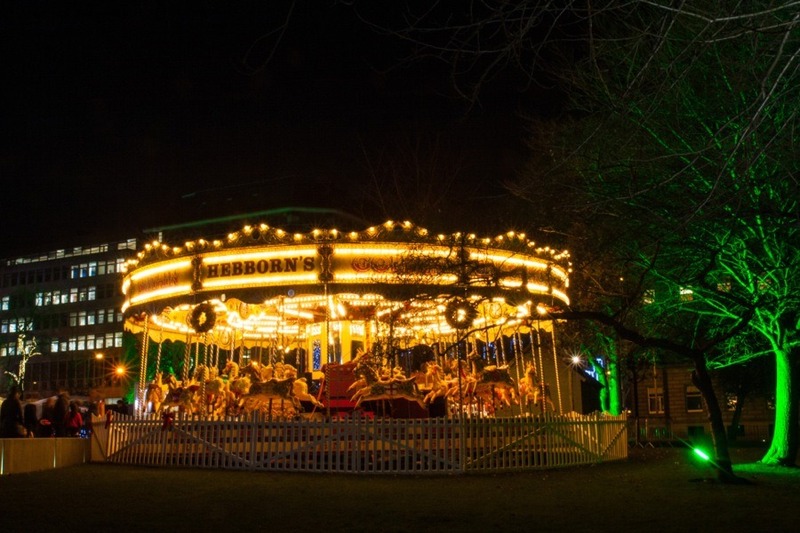 Usually it is located on Princes Street and in East Princes Street Gardens, but this year it has expanded into St Andrew Square. 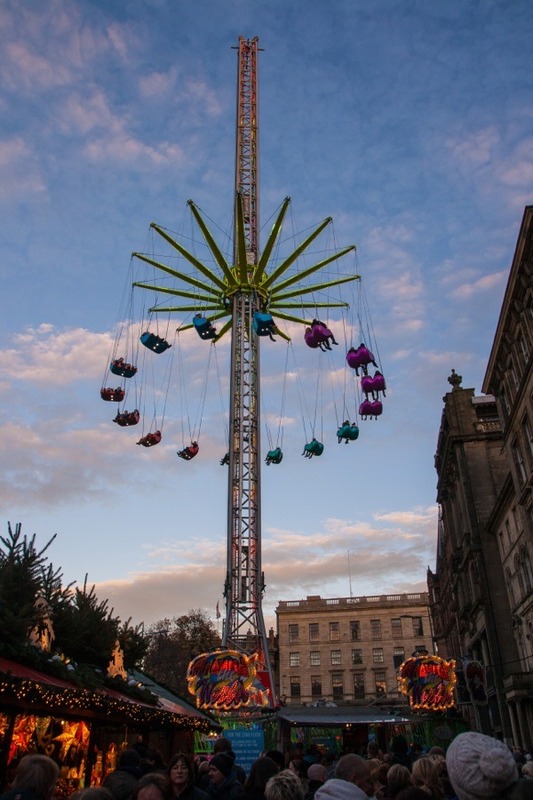 The main attraction is a new one this year, the Star Flyer. 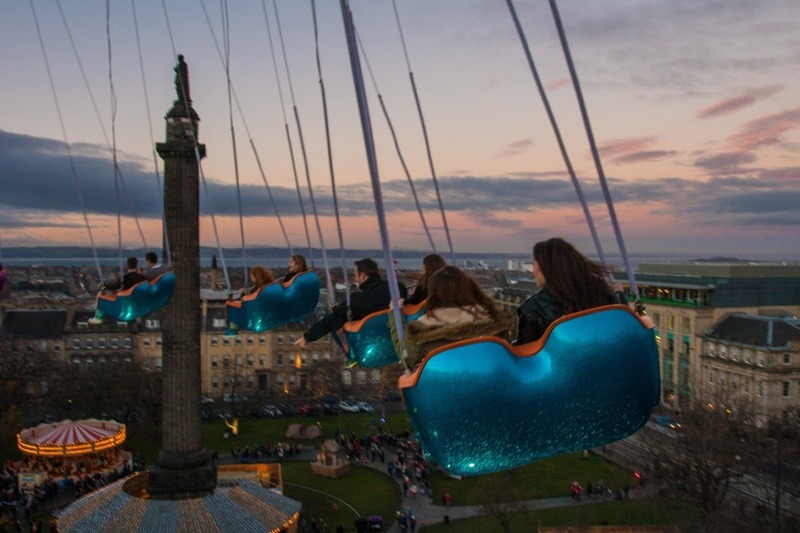 Rising around 60 metres in height (almost 200 feet) it promises a unique 360 degree view of Edinburgh. 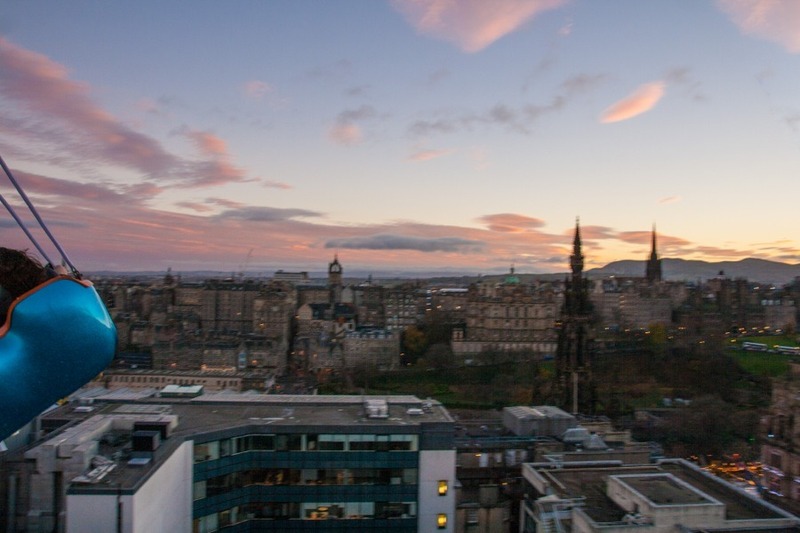 It towers above the neighbouring buildings in the square, and is taller than the nearby Melville Monument, The Balmoral, Jenners and Harvey Nichols. 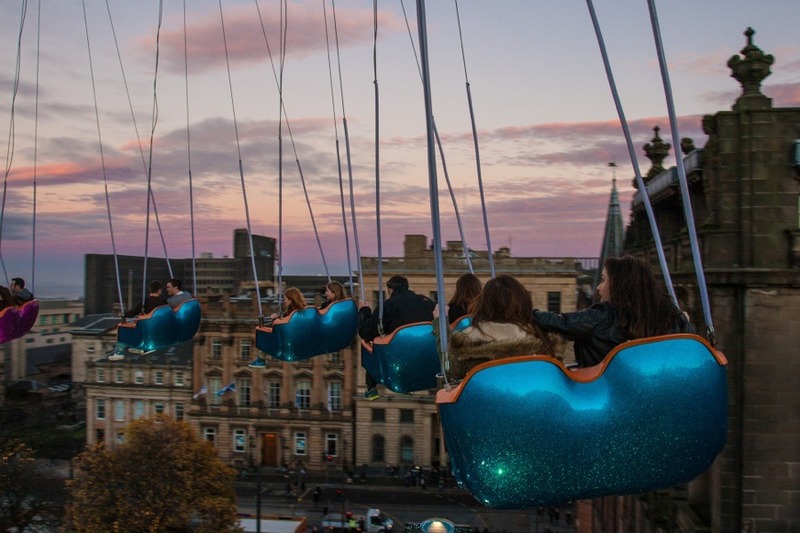 Brave participants are suspended in bucket seats below a giant star, which rises to the top of a central column while spinning around. 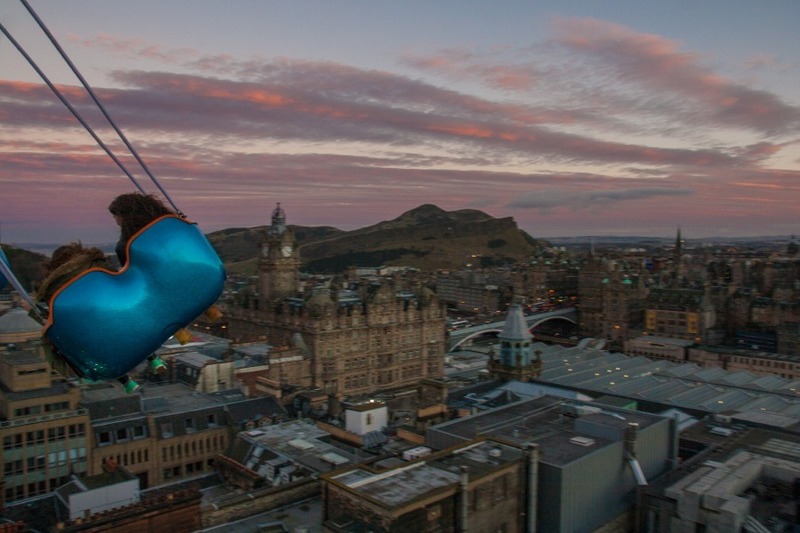 We were game for a different view of Edinburgh so paid our money and climbed aboard. 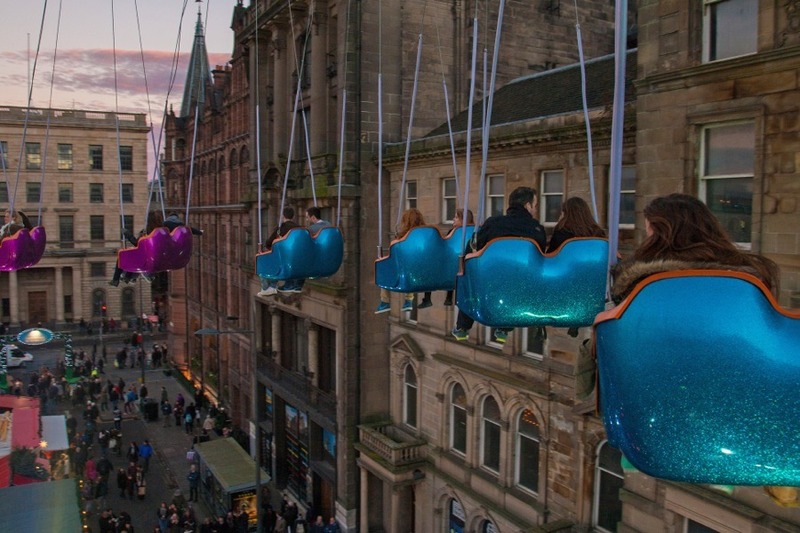 It was a slightly surreal feeling as we rose slowly above the market below. 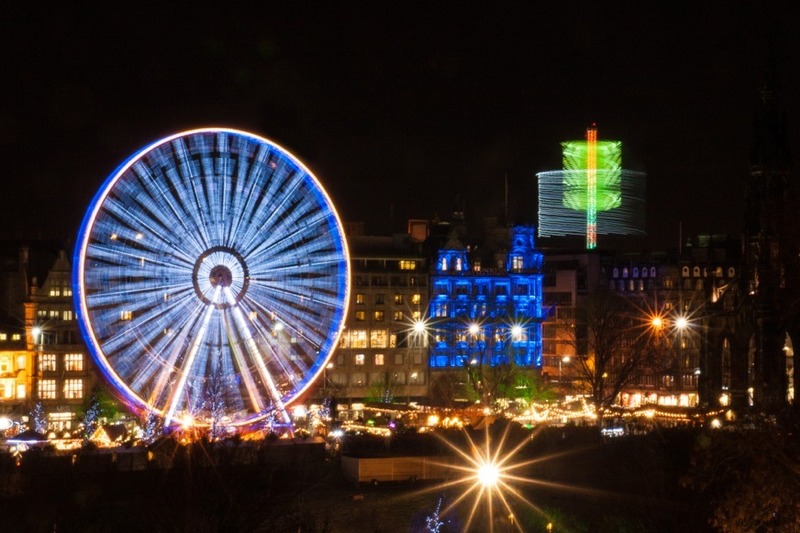 Being level with the surrounding buildings certainly afforded us quite an unusual view of St Andrew Square. 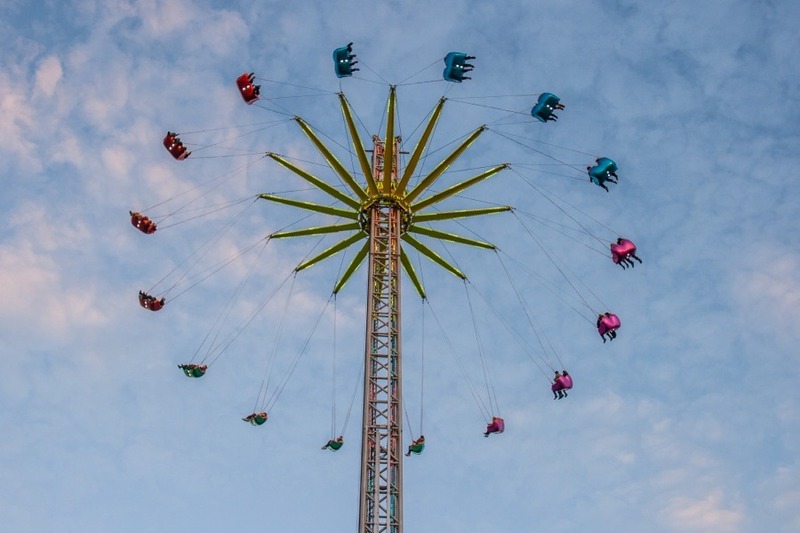 As we climbed higher the Star Flyer began to spin a little faster. 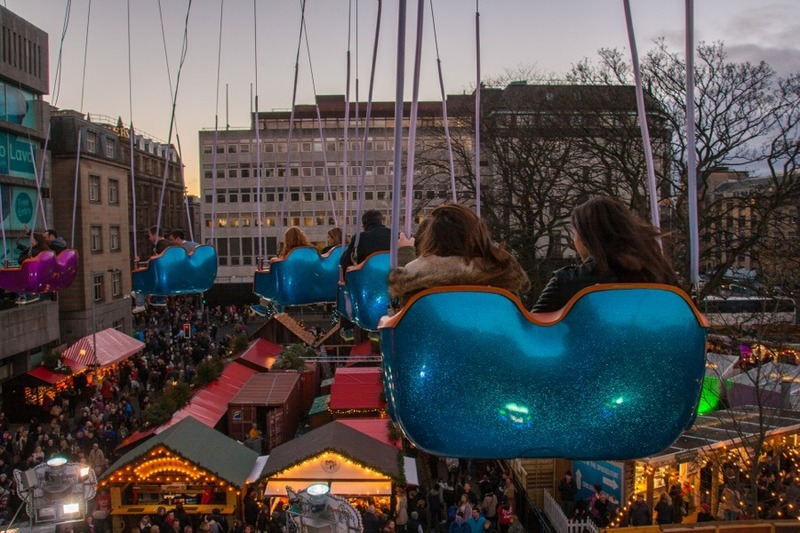 But that was nothing compared to the speed when we reached the very top – 10 metres a second for those that are interested (around 36 kilometres an hour, or 22 miles per hour in old money). The views from up here are fantastic. Looking out across the Old Town we must have been at approximately the same height as the spire of St Giles’ Cathedral. 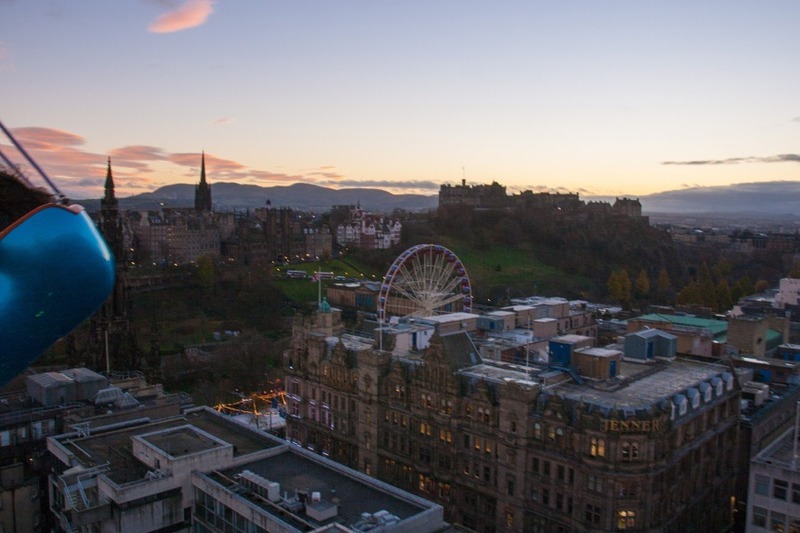 Jenners seemed far below us, while Edinburgh Castle also seemed on a similar level to us. 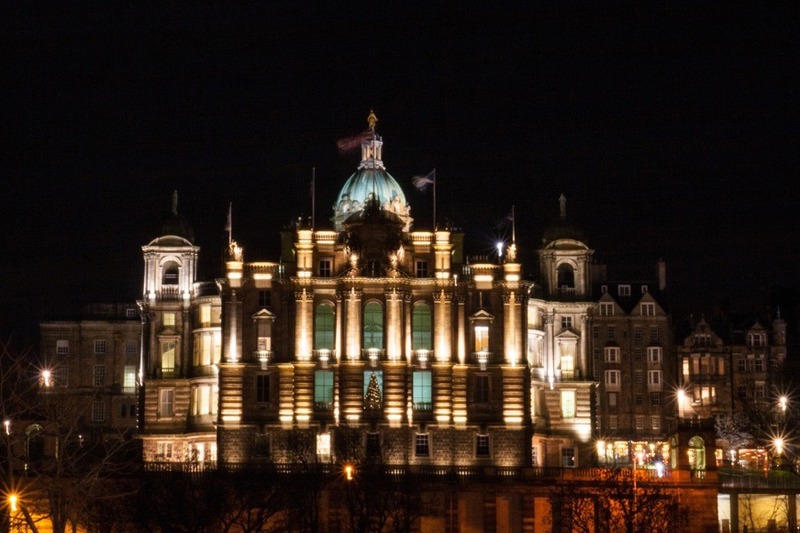 The Balmoral, which always seems huge at ground level, looked almost insignificant. 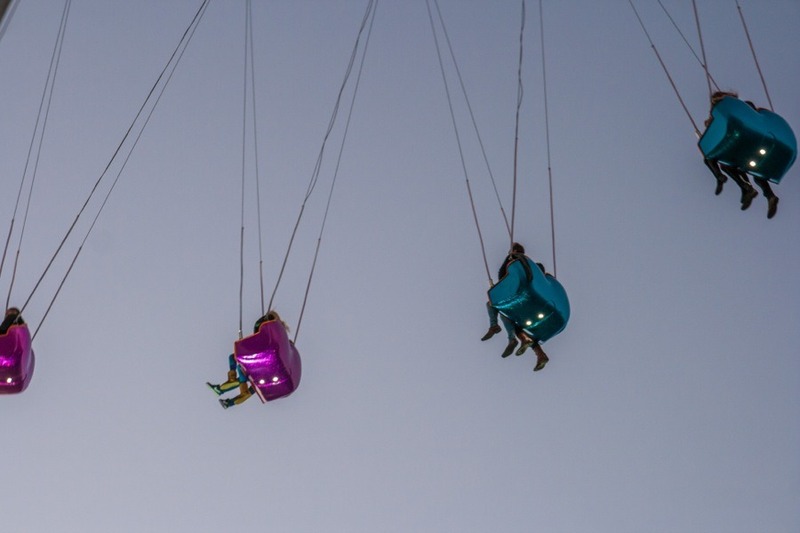 My only complaint about the Star Flyer is that the ride doesn’t last long enough! After a few spins we were on our way back down again. 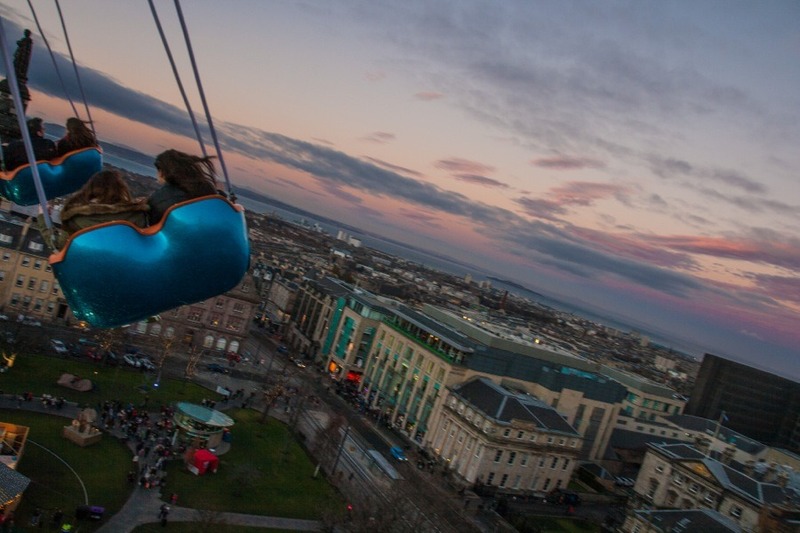 With the sun on its way down we made our way up from St Andrew Square to The Mound for a different view of the Star Flyer. 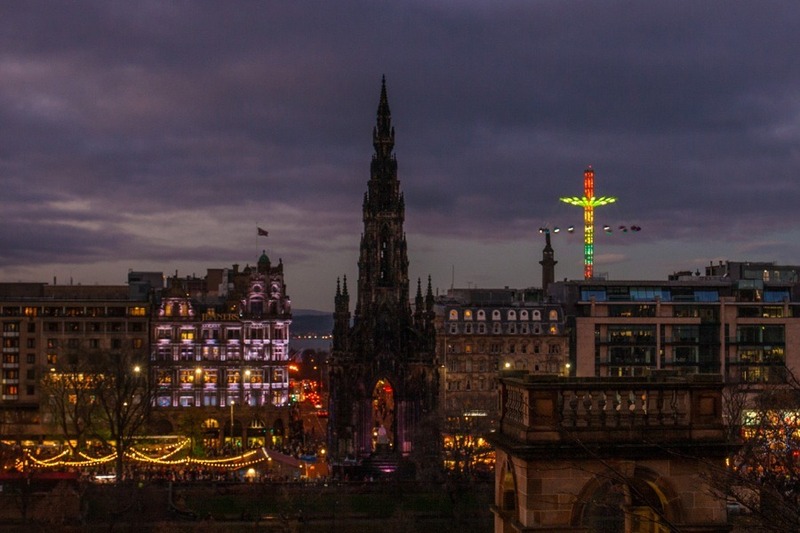 From there we headed down to George Street where The Dome’s now traditional Christmas decorations were illuminated against the darkening skies. 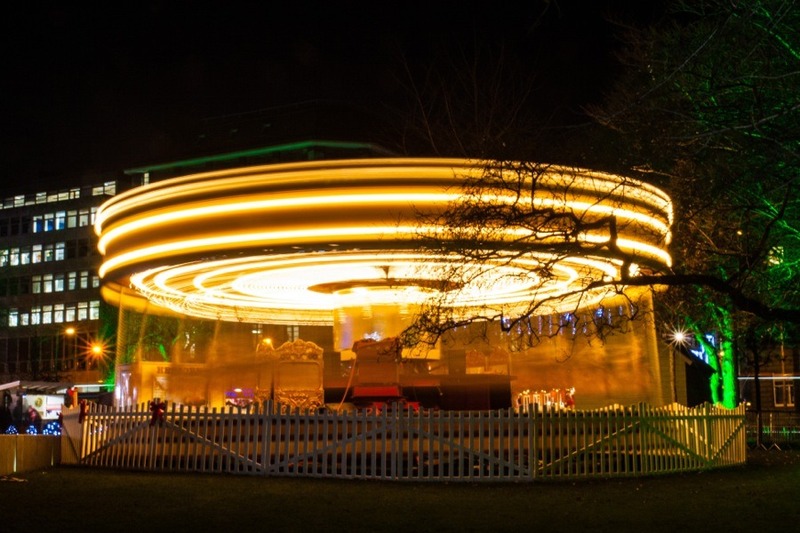 Back in St Andrew Square I stopped to take a photo of the carousel, now with its lights on. 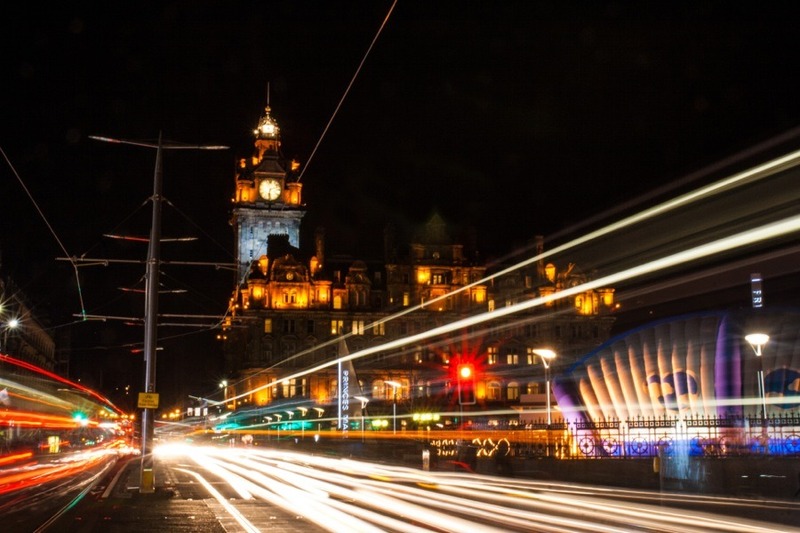 Then again on a long exposure – it doesn’t go as fast as this makes it look! 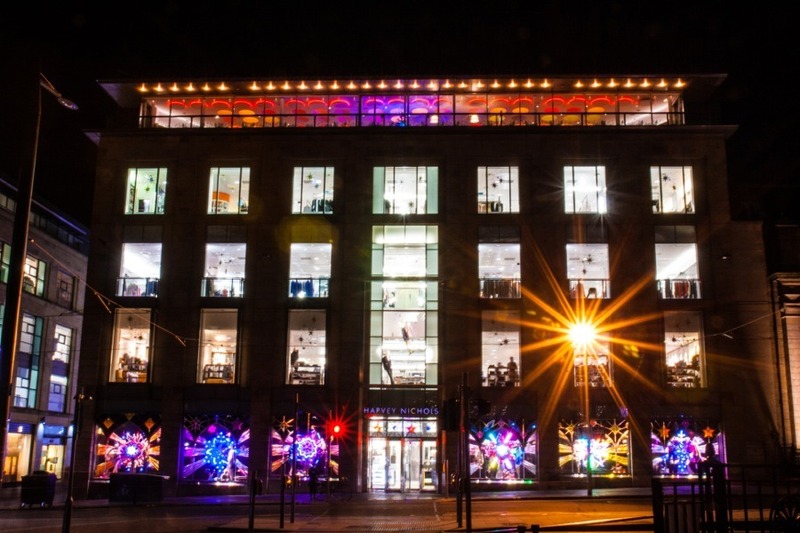 On the other side of St Andrew Square Harvey Nichols was lit up like a Christmas tree. Ok, not quite, but still an impressive sight at night. 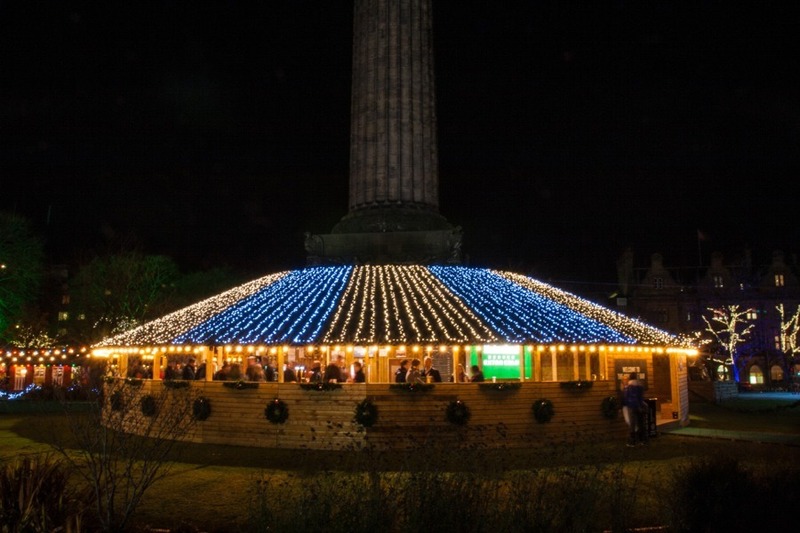 At the centre of St Andrew Square is the Melville Monument, and for the Christmas season its central column has been surrounded by a round bar. 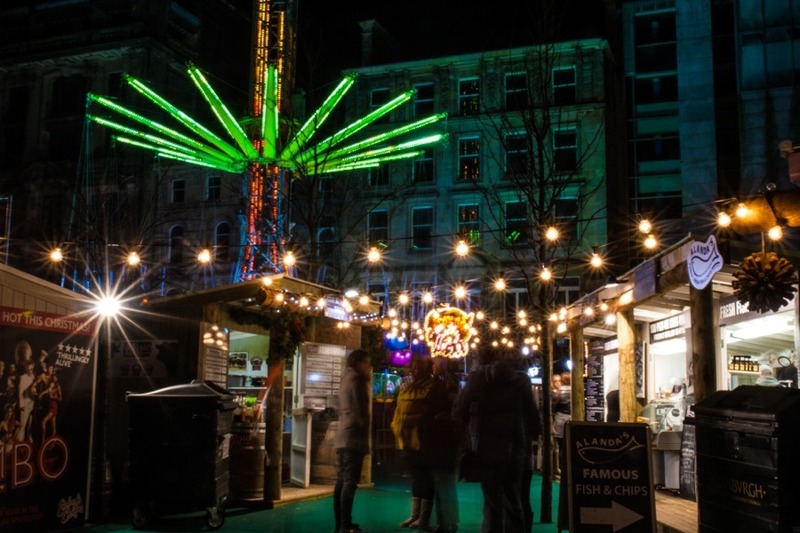 There are various food and drink stalls in the square, all of them in the shadow of the Star Flyer. 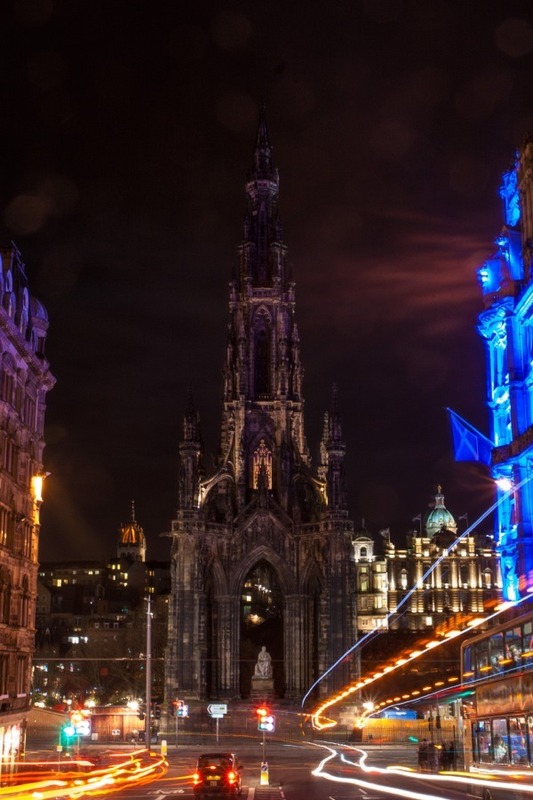 We left the square via South St David Street which does a great job of framing the Scott Monument. 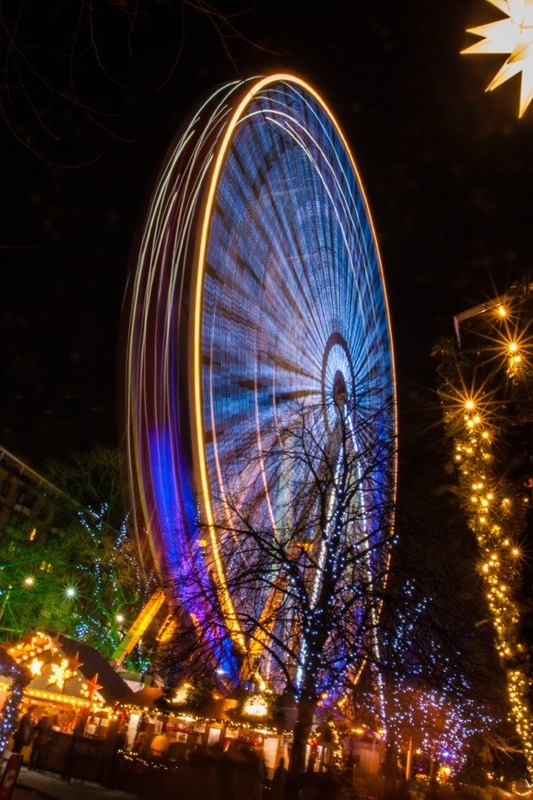 With night having well and truly fallen I took the opportunity to take some long exposure photos on Princes Street, starting with the Big Wheel. 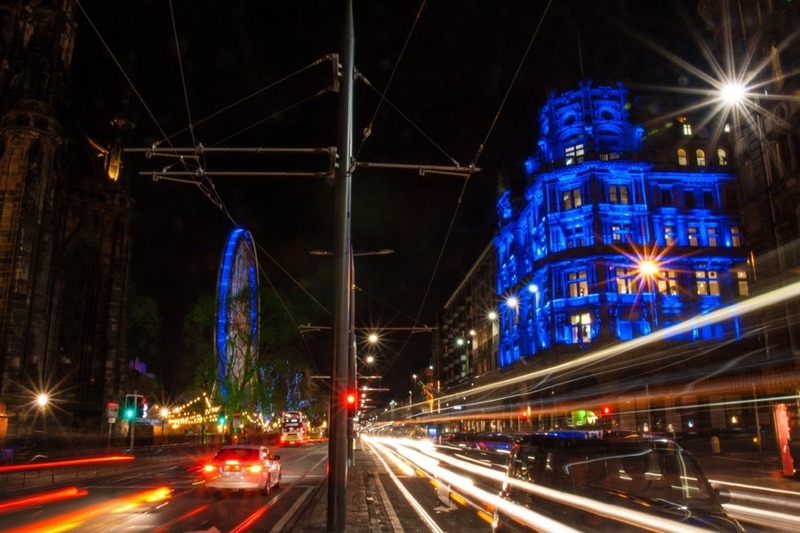 With the steady stream of buses and taxis, Princes Street is great location for taking light trail photos. Here’s one looking towards The Balmoral. Here’s another looking in the opposite direction towards Jenners and the Big Wheel. 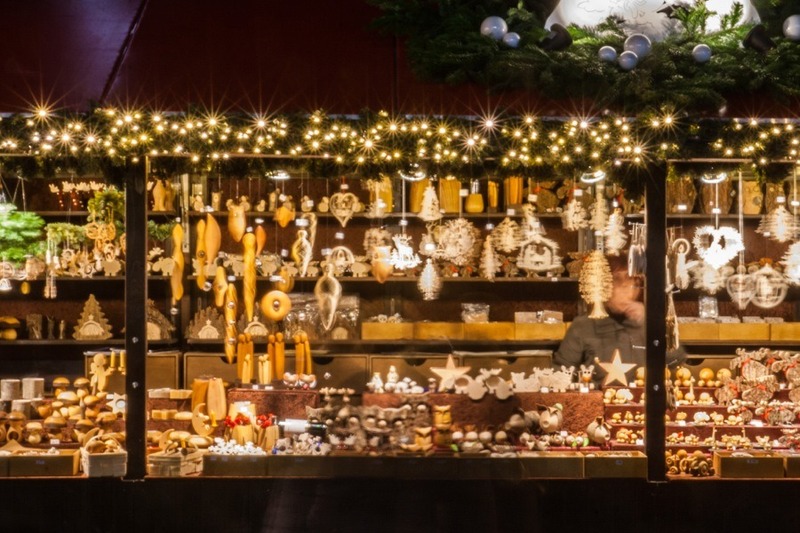 Stretching along the south edge of Princes Street, above East Princes Street Gardens, are a multitude of stalls selling all kinds of Christmas-themed items. Some higher-quality than others it has to be said. 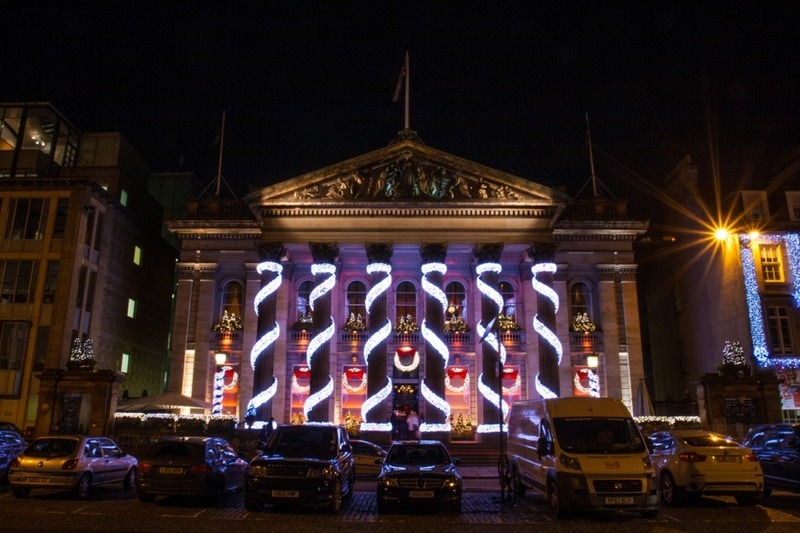 Across the other side of the gardens the Bank of Scotland headquarters looked resplendent lit up on The Mound. 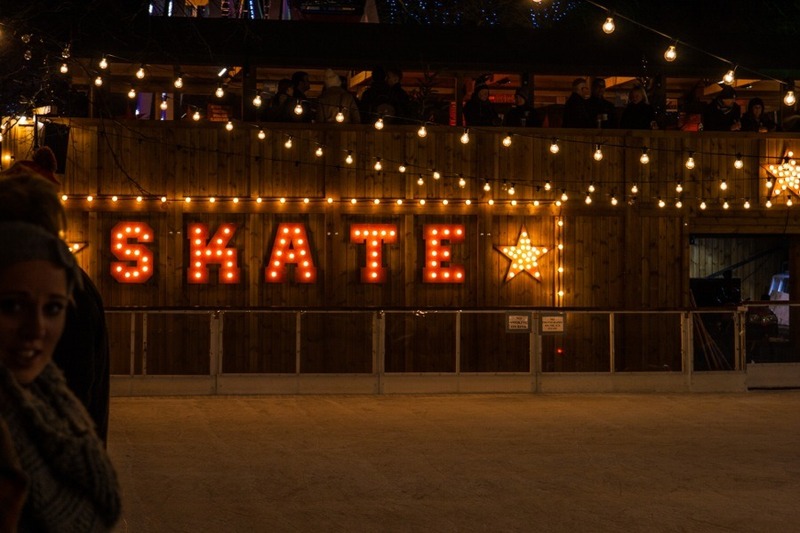 One of the major changes from previous years’ Christmas Markets is the relocation of the ice rink from the gardens to Princes Street itself. While this makes it more accessible, it does appear to be smaller. We slowly made our way through the crowds looking at the stalls. Crowds that can be made to largely disappear with long exposures. 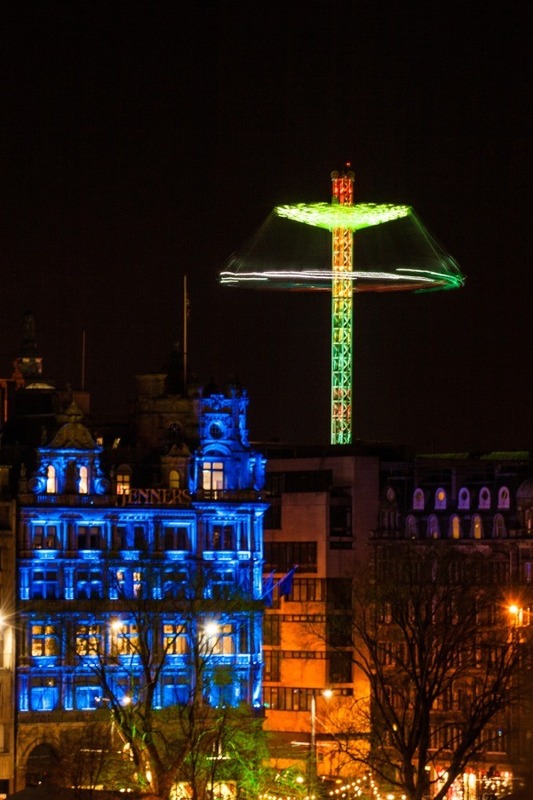 Further along Princes Street we got a closer view of the Big Wheel. 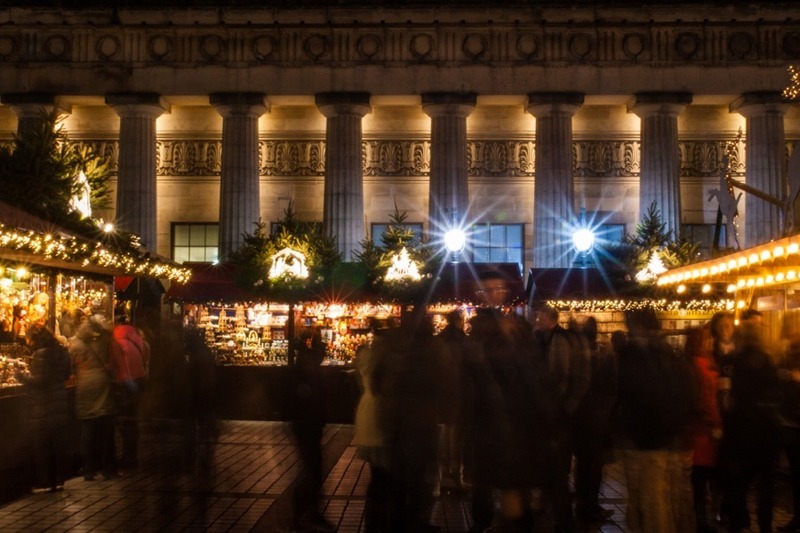 At the far end of the Christmas Market are even more stalls, with the Royal Scottish Academy serving as a rather magnificent backdrop. In the opposite direction there’s another view of the Big Wheel. 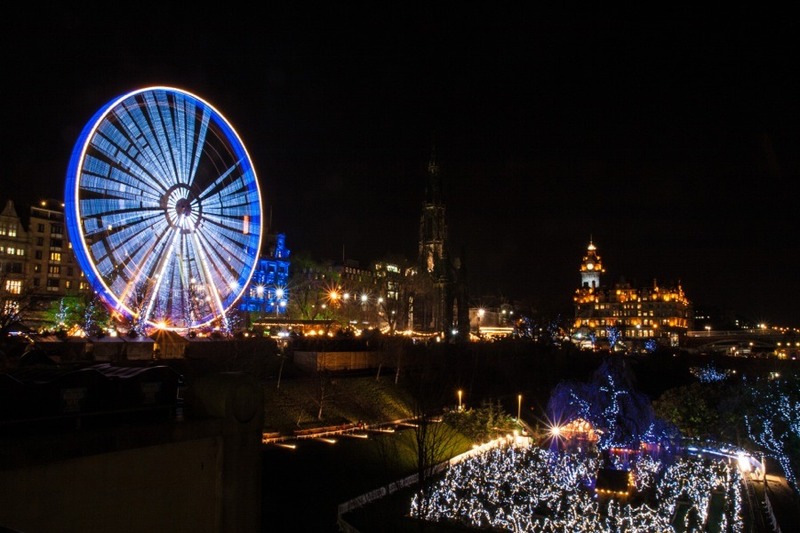 We walked along the front of the Scottish National Gallery towards the Playfair Steps, pausing to take a photo of the Big Wheel plus the Christmas Tree Maze and Santa Train in the gardens below. 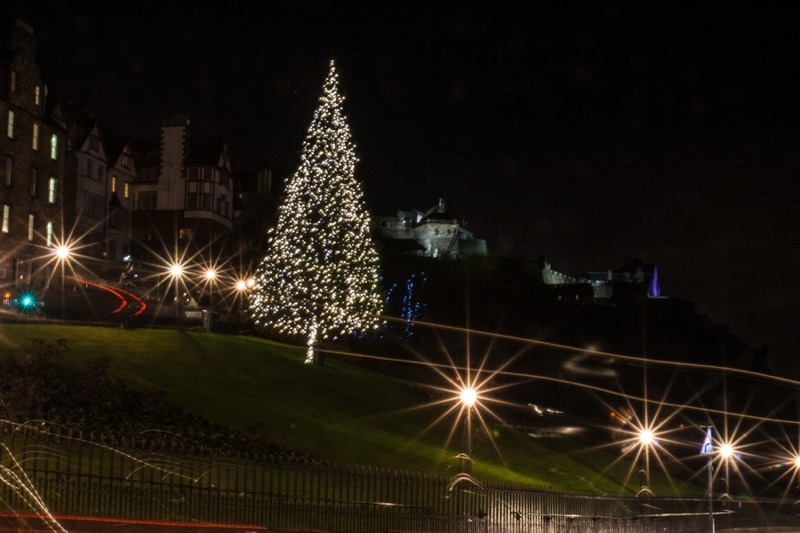 At the top of the Playfair Steps and in front of Edinburgh Castle is a large Christmas tree standing precariously on a steep slope. 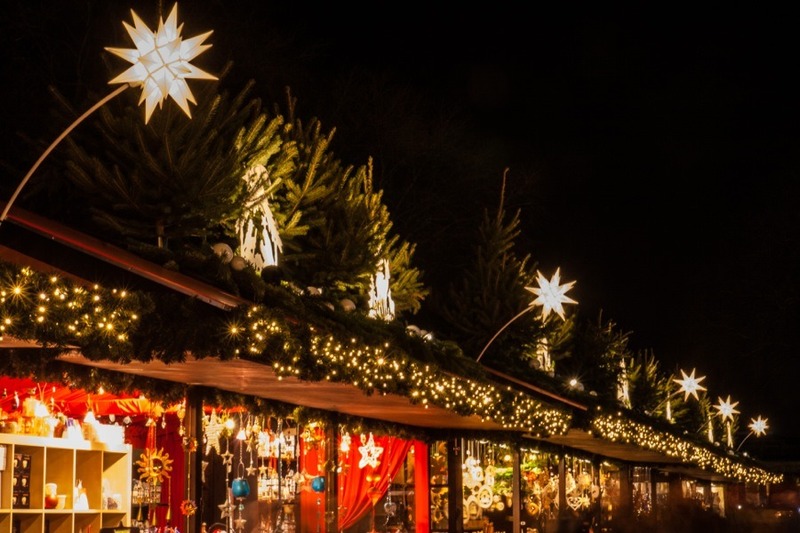 The reason for climbing up here again was to take photos of the Christmas Market attractions now that it was properly dark. 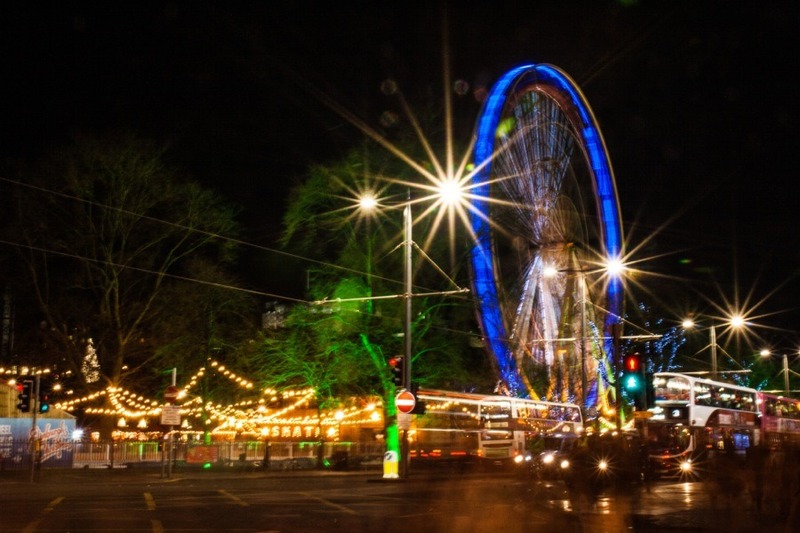 Both the Big Wheel and the Star Flyer are rather photogenic in the dark. 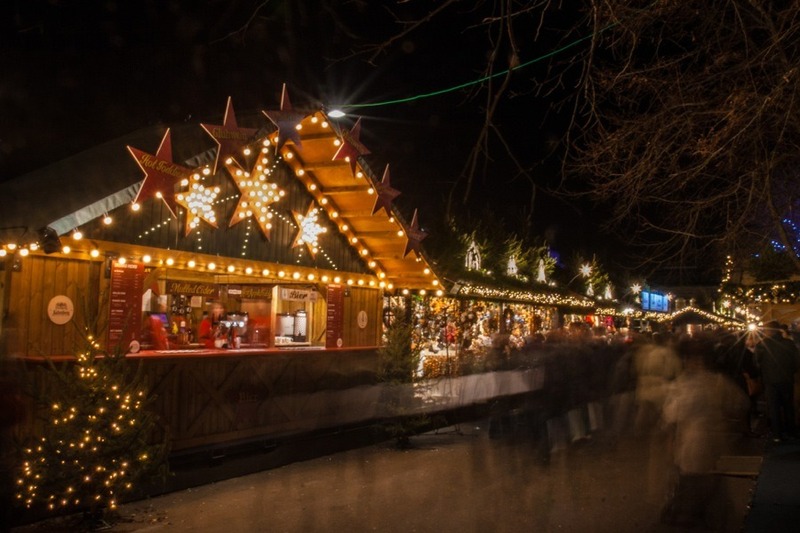 Next time I visit the Christmas Market I hope there will be less photography and more German beer drinking! 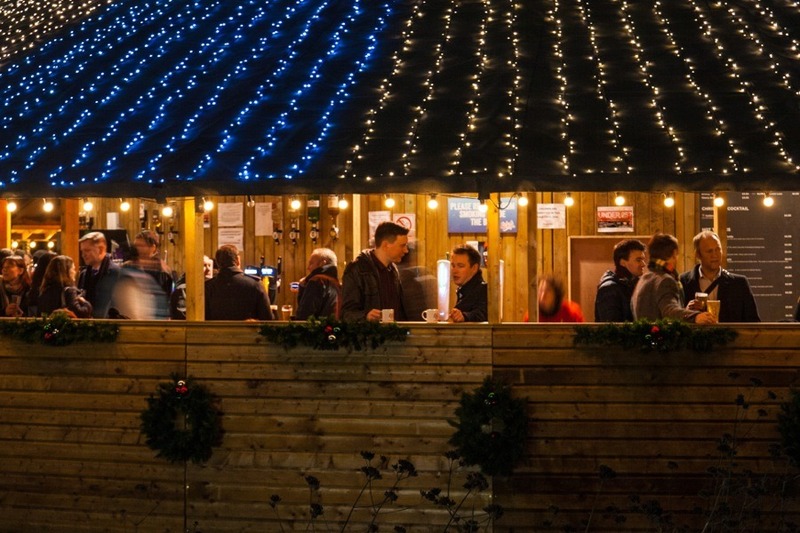 Published on the 12th of December 2013 at 4:21 pm. Updated on the 2nd of May 2016 at 6:21 pm.